Swedish dominance in the Final Round of 2018 Orienteering World Cup in the Czech Republic. A last world cup race in 2018 took place in the heart of Mladá Boleslav. Swedes Tove Alexandersson and JonasLeandersson took control over the technical sprint distance and proved Swedish dominance in the World Cup Final Round in the Czech Republic. After several rounds of competition, Swedes Tove Alexandersson achieved the women's World Cup championship and Swedes Matthias Kyburz achieved the men's World Cup championship. The Final Round of 2019 Orienteering World Cup has come into China time. With the perfect ending of the Final Round of 2018 Orienteering World Cup in the Czech Republic, the countdown to the Final Round of 2019 Orienteering World Cup begins! The world's highest level of orientation events, which has separated from Asia for decades, will hold in China for the first time. Otherwise, it's not just China's first Orienteering World Cup, it's also the first time that the IOF has hosted a major international event in the world's most populous country. By convention, the Orienteering World Cup is set for four races. And the China final as the forth race will get the world’s attention on south China. The first race: June 6-11, 2019, Finland. The second race: August 13-18, 2019, Norway. The tird race: September 26-29, 2019, Switzerland. The 2019 Chinese Orienteering World Cup is not just about Orienteering. It wiil be a rare event in Chinese orienteering field because of its high profile and strong lineup: provincial leaders supervise combat themselves; best orienteering players from all the world gather here; the first-class technic team in the world supply a screaming race experience. It will be an orienteering event more of a global cultural event. The field set in ancient villages along South China Historical Trail. What’s more, these villages have many cultural heritages, including old buildings, human landscape, millennial customs, and so on. By then, the international image of China, about activated ancient culture, will be presented to all the world through the setting of featured field. The field is rooted on South China Historical Trail, therefore it is The Belt and Road in sports. The orienteering event starts from South China Historical Trail, takes orienteering as a carrier, and spreads Chinese historical chulture and development to all the world. Orienteering is popular in China now and the goverment commits to creating a global model of orienteering events. Orienteering is popular in China now. Regional Orienteering Championships and World Orienteering hold in China have become regular events of Chinese orienteering sport. In recent years, the South China Historical Road Orienteering Championship has been highly sought after by the Orienteering area in China. Additionally, with the help of the South China Historical Road World Orienteering Ranking Event, Historical Road Orienteering will be created as a model of global orientation. 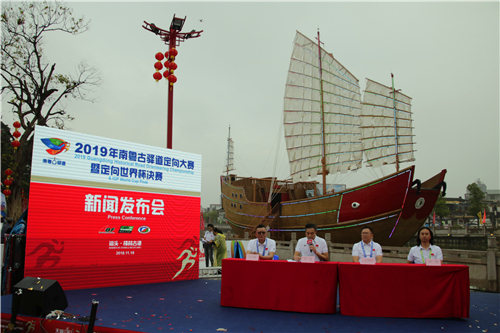 The Final Round of 2019 Orienteering World Cup has come into China time officially. Next, China will hand over a perfect orienteering transcript with high profile and strong lineup to the world. China orienteering is on the way! The Final Round of 2019 Orienteering World Cup, we are coming!